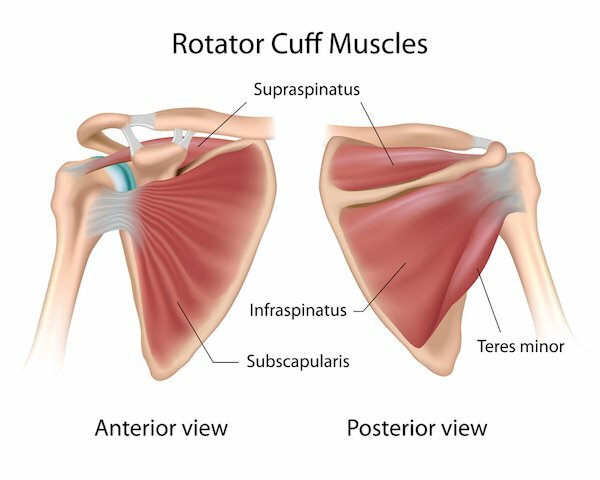 The rotator cuff is essential for a strong and stable shoulder — this guide can help you prehab and rehab. The shoulder is a shallow ball and socket joint that has the handy ability to move in multiple directions. This allows you to lift humongous weights, throw baseballs and footballs really hard, or throw your arms up in disgust at a referee’s decision. All this mobility is great, but the shoulder needs stability too. The four muscles of the rotator cuff work hard to keep this ball and socket joint in a vertical position no matter what position your shoulder is in. Supraspinatus: It holds the humerus in place and keeps your upper arm stable. Infraspinatus: Rotates and extends your shoulder. Teres Minor: Assists with rotation of the arm away from the body. Subscapularis: Holds your upper arm bone to your shoulder blade. These muscles surround the shoulder joint, keeping the head of your upper arm bone in the shallow socket of the shoulder and holding your joint in a vertical position. The best cure for any injury is prevention and the rotator cuff is no different. Also, exercises that encourage good posture and strengthen the muscles between the shoulder blades will keep the shoulder joint in good position helps keep the rotator cuff happy. However, if it’s too late to prevent an injury and you’re trying to strengthen an injured rotator cuff, take a leaf out of strength coach Andy Van Grinsven’s book, who is 6 months post op and has regained almost full function of his cuff. When the rotator cuff is hurt, all the fun and cool stuff you can do comes to a screeching halt. We strongly urge you to listen to your physician or physical therapist when rehabbing an injury. There are a few tips that tend to be repeated when folks are rehabbing from a rotator cuff injury. Cross education is the process of strength transfer from the non-injured side to the injured, which is attributed to neural adaptations. This helps recovery and reduces the strength and muscle sucking effects of your limb being immobilized. So evidence suggests that people who work around injuries will heal faster even when one side is immobilized. Furthermore, keeping active will keep you in a better frame of mind too. Van Grinsven, who underwent surgery for a torn supraspinatus and posterior labrum, found the following exercises were useful while his arm was in a sling. They’re important because they may help strengthen the muscles that are immobilized due to cross education, plus they act as core work — and many traditional ab exercises are hard to do with your arm in a sling. Lie on your back underneath a barbell in a squat rack with your knees bent to 90-degrees. Grab the bar with one hand and pull your chest toward the bar. Firmly grip one dumbbell with our entire back on a bench and press and reach. Set up with the barbell a few inches away from your shoulder and press and reach away from your body. Set up with your arm fully extended and firmly grip the handle. Row towards your hip keeping your shoulder down and chest up. Hold the resistance in same hand as the knee which is down, squeeze that glute and row towards your hip without leaning back. If you don’t have access to chains, holding a dumbbell at arms length will work. Set up with the band around the top the hips and walk away from the anchor point until tight. As a lot of hip hinge exercises hold the weight in both hands (except the single leg variations) and this is a great variation if holding weight isn’t possible. While working around an injury as serious as a rotator cuff, it’s not all sunshine and rainbows. There will still likely be pain and discomfort. Keeping an open line of communication with your doctors during the recovery process is important as well. 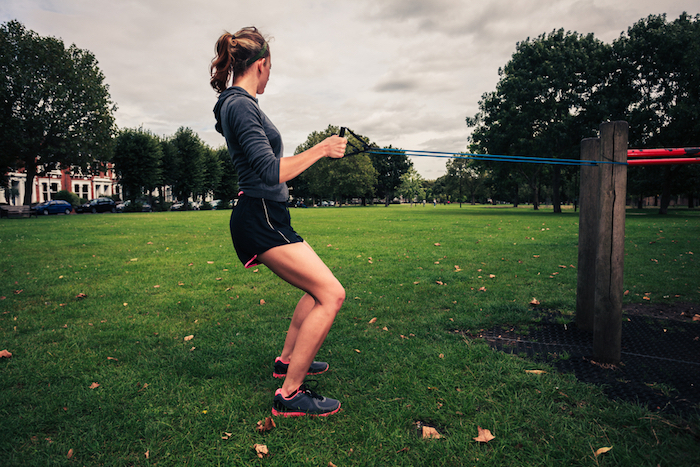 Using common sense while working around an injury makes sure the recovery process is smoother. There’s no doubt shoulder injuries are devastating and it’s easy to write yourself off or coast through rehab. 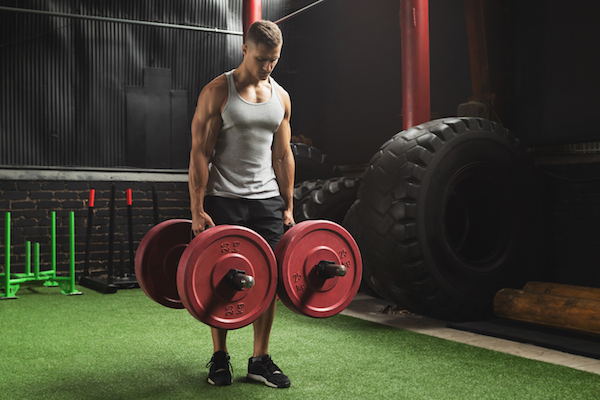 However, if you want to recover faster and retain as much strength as possible, then cross education and shoulder friendly lower body training will help. Andrushko JW, et al. Unilateral strength training leads to muscle-specific sparing effects during opposite homologous limb immobilization. J Appl Physiol (1985). 2018 Apr 1;124(4):866-876. Hendy AM, et al. Cross education and immobilisation: mechanisms and implications for injury rehabilitation. J Sci Med Sport. 2012 Mar;15(2):94-101. Vigelsø A, et al. Six weeks’ aerobic retraining after two weeks’ immobilization restores leg lean mass and aerobic capacity but does not fully rehabilitate leg strength in young and older men. J Rehabil Med. 2015 Jun;47(6):552-60. Shane McLean is a Certified Personal Trainer who’s worked with a wide variety of clients, from the general population client all the way to ex-Navy seals and college athletes. Shane is a big believer in exercise being a gift for the body and never a punishment because exercise is fun and never just a “work” out. My training is focused on fun and simplicity. In today’s, heavily-scheduled, electronically plugged-in world, where you stare at your smart phones, check your emails/texts and generally sit for too long, there is a real disconnect between you and your body. This is where I can help you.I want you to have better mobility, stability, and strength, so you can move better and feel better, and I want to help you to better deal with the challenges of daily living. When you get to the gym I want you to crush your deadlifts, squats and bench presses with a smile because getting stronger is also fun. Shane writes regularly here on a variety of health and fitness topics while guzzling copious amounts of coffee. Check out his professional website at The Balance Guy.